I recently finished reading these excellent travelogues made by Canadian cartoonist Guy Delisle. I found these while browsing the comic book aisle at the local library, and I consider myself lucky, because Travelogues are for some reason becoming one of my favorite kind of books to read. In “Shenzhen – A travelogue from China” (2000), Delisle describes a three month stay in Shenzhen, China. We follow his thoughts and daily routines through many quirky and tragicomic episodes. Cultural differences are the main motif of the book, but it also makes room for topics like loneliness, food, awkwardness and the occasional brush with death. 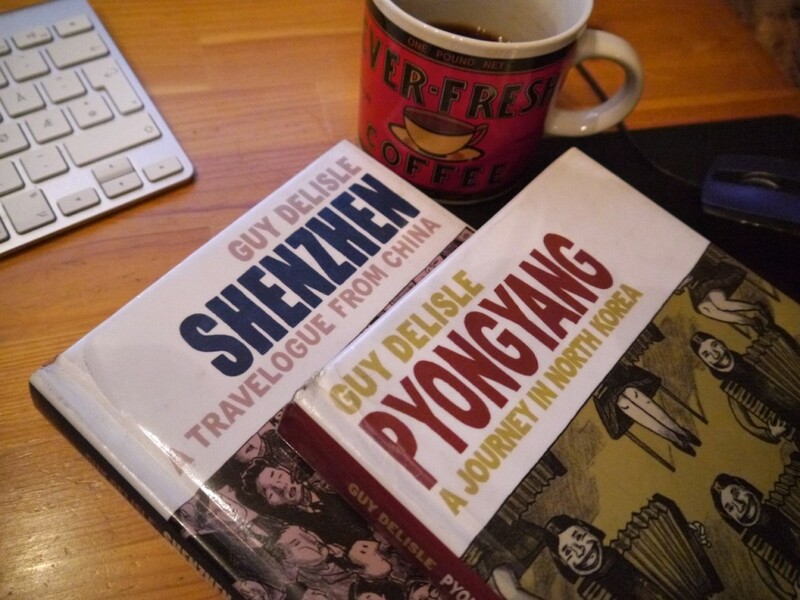 “Pyongyang – A Journey in North Korea” (2003) describes Delisle’s experiences while working at an animation studio in North Korea’s capitol, Pyongyang. The book gives a funny and educational insight into the daily workings of the world’s most isolated country, everything through the perspective of a westerner. Strict rules, personal guides who follow you everywhere, restaurants with very limited menus and copious amounts of communist propaganda are just some of the things he had to go through during his stay. In short, a very entertaining read. Delisle’s comic drawing style is as fascinating as it is simple. His caricatured self and the people he meets are incredibly expressive, something which must be due to very good economy of line. At first, I didn’t like the muddy gray tones which are used for most of the shading, but it’s easy to get used to. Maybe the originals are shaded with pencils? Nonetheless, Delisle’s panels are superbly timed, perhaps due to his experience as an animator. Reading the comic pages makes you almost feel like you’re there, watching the world through his eyes. As an added bonus, there are small tips on animating here and there, which is always fun to read. I’m currently reading my way through “Burma Chronicles” (2007), and I’ll try to write a little bit about it when I’m finished.